B U B B L E G A R M: Top 10 Nail Polishes for Summer..
Top 10 Nail Polishes for Summer.. I picked 10 of my favourites from my stash that I have been rocking and will be rocking this summer! OPI: Jade is the new black - This is a dark jade green with a creme finish that needs 2 coats. I contemplated whether it was a summer colour or not, but it is! It's a nice way to do a bright colour without being too loud. It looks great on the nails and toes. AMERICAN APPAREL: Malibu Green - This is a bright turquoise that's more on the green side with a creme finish that needs 1-2 coats. It oozes attention and EVERYONE is bound to comment on your nails. The only downside is if you forget to use a base coat it stains your nails. REVLON: Minted - This is a pale pastel mint green with a creme finish that needs 3 coats. It's worth the effort as the outcome is beautiful and flattering on almost any skin tone. I used to have Barry M's version, but it just made my hands look ill.
ESSIE: Lapis of Luxury - This is a pastel blue with a slight hint of purple that has a creme finish and needs 3 coats. I absolutely love this colour as I love lapis, it looks interesting and every time I wear it I get compliments. MAC: Mercenary - This is a metalic golden bronze that needs 3 coats. I love golds for the summer as it just emphasizes a tan and looks great with gold / bronze jewellery. This was limited edition from the Style Warriors collection a couple of years back. ESSIE: Haute as Hello - This is a pastel peachy coral creme shade that has a matte finish and needs at least 3 coats. It's not a breeze to apply, but when done with patience achieves a beautiful manicure or pedicure for the summer. BARRY M: Coral 296 - This is a bright true coral shade that looks amazing with a tan and only needs 1-2 coats. BARRY M: Bright Red 262 - I'm not usually one for reds in the summer but this red is SO bright with a glossy creme finish and only needs 1 coat. Enough said! OPI: Mod about you - This is a whitened pink with a blue undertone that has a creme finish which needs 3 coats. It sort of looks like a pink toned tipp-ex. This colour is by far my favourite for summer, EVERYONE comments on it, FYI - I was wearing it at the Mac event in the previous post. What are your favourite polishes for summer? These are all really beautiful colors! I'm loving #6 the peachy coral by Essie! I love coral shades for summer - at the moment I'm addicted to OPI's Shoot Out At The OK Coral, which has a blue flash to it. So bright. Love your choices too. I wish I could find a mint green that didn't turn my hands red. absolutely love minted & mod about you! I love the OPI's Strawberry Margarita and Barry M's Coral! Gorgeous shades! Zoya Max is my all time favourite colour; a beautiful hot pinky red. OPI Dutch Tulips is really similar. I also love Lollipop, Geranium and Plumberry from Essie. Love the colors you pick! Mine would have to be China Glaze Sun Worshiper, Zoya Rica, Tarte Deco by Essie (I think that what it called and any pinks, pastel colors. I'm seriously a nail polish addict. where do u buy your opi nail polishes in the uk muhsine? really want to test out mod about you!!! I am wearing Barry M Coral 296 this week, I love it. Such a happy colour. I love all of these, I have Mod About You and find it so difficult to apply! i like that you added the OPI Jade shade in there..I think it would be really nice on toes during the summer, too! 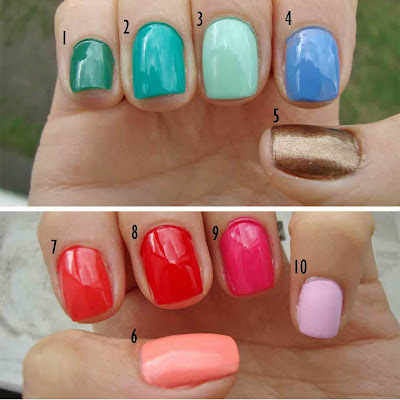 I have a color like number ten on my toes, I abs love it! Sooooo cute! Beautiful colours. I love Essie's Haute as Hello but it is such a pain to apply, not one to do in a rush. #10 reminds me of OPI Lucky Lucky Lavander. You must try that shade sooooo pretty. i've been obsessed with nailpolish lately. the OPI mod about you is my fav! Simply loved the update!! We are now a follower and will be keeping track of all the latest posts.